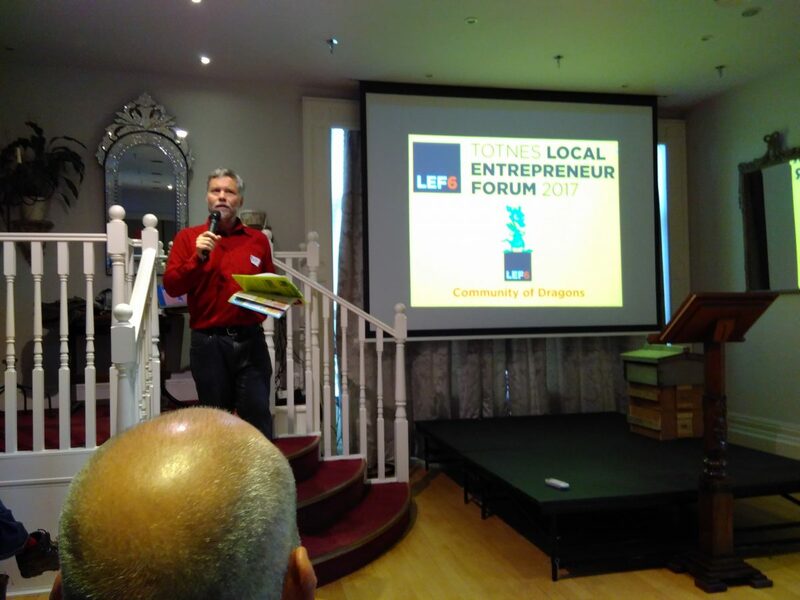 Rob Hopkins reports on the sixth Totnes Local Entrepreneur Forum, an event about supporting business start-ups that is known to regularly move people to tears (in a good way). 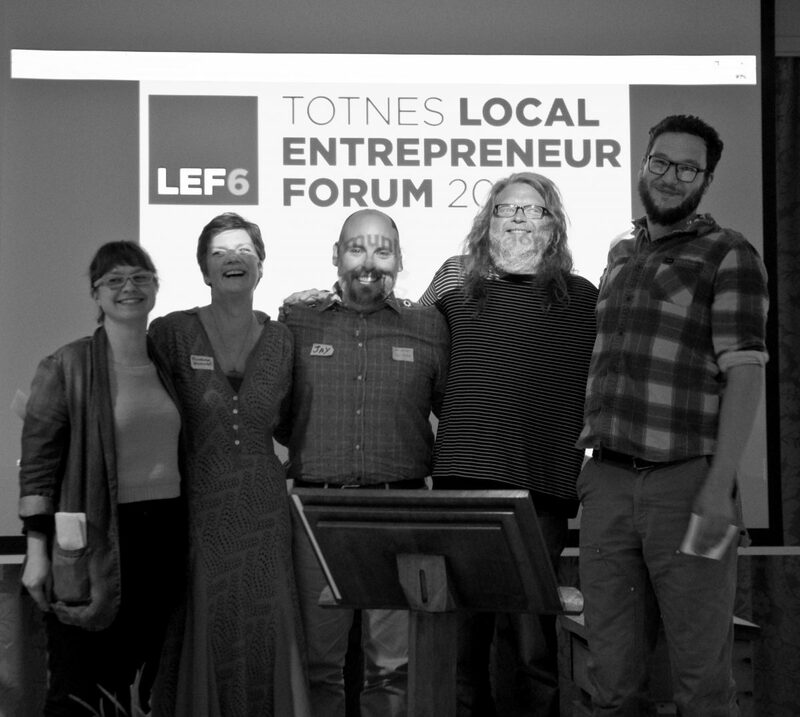 This year’s Totnes Local Entrepreneur Forum was the sixth. This remarkable event, put on by the Totnes REconomy Project, is one of the highlights of my year. It was also timed to coincide with Global Divestment Week, organised by 350.org, in part to explore the question of “once you’ve divested… then what?” This is an event that invites people to reimagine investment, in a way that serves the building of local economic resilience, care and community. Previous LEFs have run as day-long occasions (see this write-up of last year’s), also featuring Open Space, workshops and other elements. This year, the event was broken down into a Hackathon, which happened in April, and the Community of Dragons, this time for the first year run as an evening event in a new home, the Ballroom of the Seven Stars Hotel. Five entrepreneurs pitched this year. 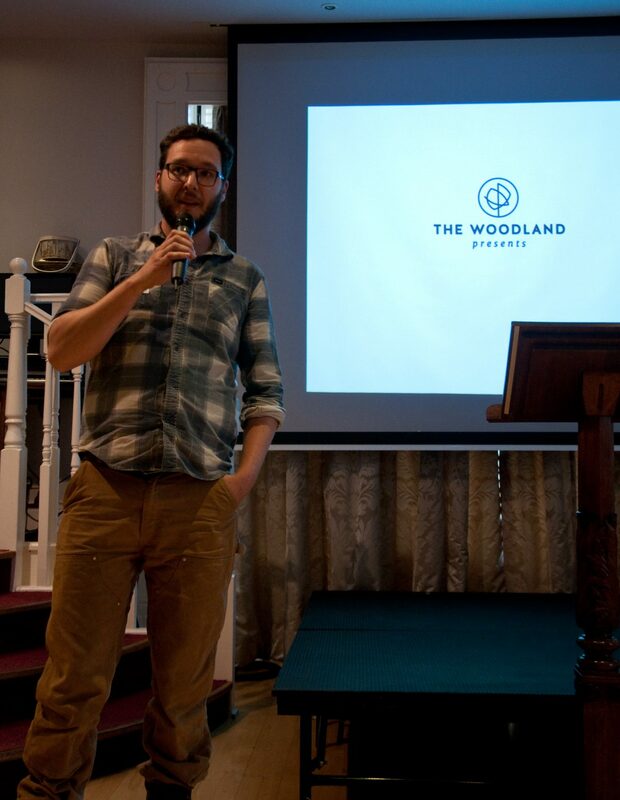 They were Bob Mehew of The Apricot Centre, a biodynamic learning project, Al Tempist presenting Woodland Presents CIC, Emily Reed of Black Bee Coombe, Jay Jacoby of Yew Media and Richenda Macgregor Potting Shed, Studio 45. About 150 people packed into the Ballroom, and the event was hosted by Jay Tompt and Hal Gilmore from REconomy, and local singer/performer, Katie Tokus. “I felt so nervous, like a skydiver about to jump out of the plane. But the good thing about this room is that everyone in the room beside me knew that the parachute was going to open. Someone who pitched before told me “it’s also like knowing that there’s this really really huge trampoline that you’re going to land on, because everybody’s really supportive. And I felt that”. “It was actually a lot more emotional than I thought it would be. It’s actually quite a vulnerable thing to do, to stand up and expose yourself and your passion, and to then receive. I’m welling up just talking about it actually. It’s more valuable than you can think it is before you go into it. The nuts and bolts and the very rational brain might think it’s just a bunch of people pledging £10, £15, but it’s much more than that”. “The experience of the pitch was really exhilarating and really fantastic, but the response was what absolutely blew me away. It was just incredible when offers came flooding in, I just couldn’t believe it. We come away with a lot of love, a lot of wellbeing, and £3-4000 of support for the project. It’s going to help us go to the next level. I’m blown away ”. “I feel very emotional right now. I feel very overwhelmed by people really responding. And also, overlooking what I see as failures, but going past that and really wanting to come alongside, and help the project get off the ground. It’s never happened to me before. The feelgood factor in the room is incredible, it’s just amazing. You could go to the bank and sit in front of a man in a grey suit, or be packed into a room full of love. Really”. “So much support. So much encouragement. From several thousands pounds in loans, to cakes, to offers to make me a honey beer, just so many things, which is really overwhelming, and exciting, and all of a sudden, I feel like all my dreams have come true. It’s not about saying “I’m perfect, I know everything, and I just need your money”, it’s about saying “actually, I want this to be born into the community, and I need your help”, and people want to stand with you on that, and that’s a great feeling”. A few days previously I had attended ‘Calderdale Bootstrap’, a Community of Dragons-style event in Hebden Bridge, which had also been a passionate celebration of the new economy, its potential, and its entrepreneurs. It is one of life’s great mysteries why Community of Dragons events have been held only in Totnes and in a small handful of other places, rather than sweeping around the world. It is such a powerful, celebratory way of stepping Transition up to the local economic challenges we face, of bringing together great entrepreneurs and the people who can help them manifest their ideas, and of creating a community of people who are invested, financially and emotionally, in the success of the new economy of their place. Most of the pitchers that I spoke to afterwards used the word “love” in their responses, mostly along the lines of “so much love in the room”. 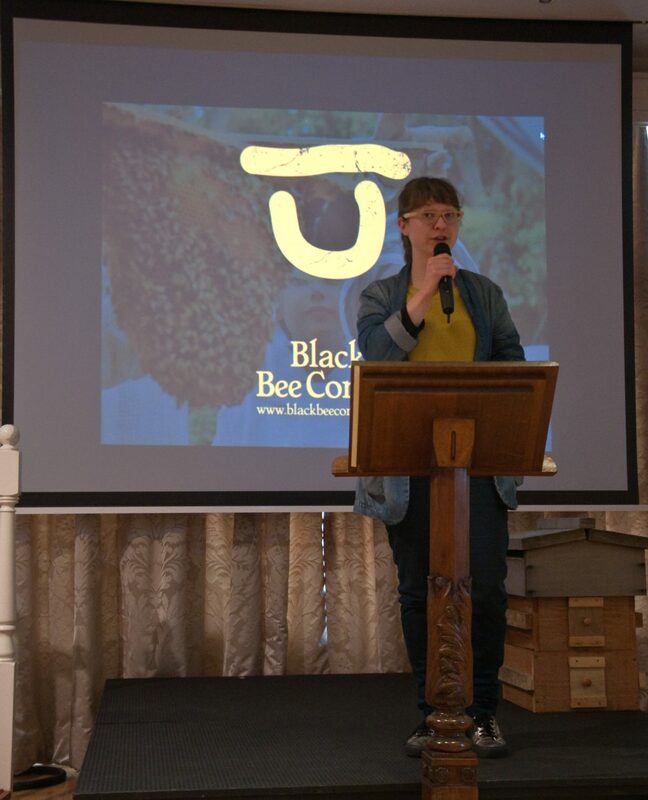 Personally, I invested £150 in sponsoring a bee hive, and I love the opportunity to help these endeavors to emerge. It’s an event where the buzz in the room is palpable, where those pitching are deeply moved by the experience, and where a community gets behind its entrepreneurs to support them into being. This year’s event also saw the awarding of the ‘Totnes Pound Prize’, a gift of Totnes Pounds to the initiative which most reflected the values of the Totnes Pound. People who pitched in previous years come back, and build a community of people who return to support new pitchers. There were people at LEF6 who had travelled from Canada and France to see it in action, and they were all very touched by what they had seen. It triggers in people the thought “what could I do?” It opens up the possibilities of all manner of new links and connections. It gives those entrepreneurs the support, before the event, to really imagine their idea in a much richer, deeper way, and to then present it so as to inspire others. As I said, it’s one of my highlights of the year. Perhaps it’s time to put one on where you live?